What was it? Half a mile away, coming across the lake, was a shapeless thing with two glaring orange eyes with black pupils. From between these, where the mouth might be, fluttered a yard of blue flame. The grey luminescence of the stars showed some kind of domed head above two short batlike wings. The thing was making a low moaning roar that overlaid another noise, a deep rhythmic thud. It was coming towards them at about ten miles an hour, throwing up a creamy wake. The Dragon of Crab Key is one of the more terrifying creations of the mind of Ian Fleming. It had a fearsome reputation which traveled across the Carribean and kept visitors from the island. gold paint to look like a dragon’s mouth. Bond still had no idea what this contraption was. Under the black and gold paint and the rest of the fancy dress it was some sort of a tractor, but of a kind he had never seen or heard of. The wheels, with their vast smooth rubber tyres, were nearly twice as tall as himself. He had seen no trade name on the tyres, it had been too dark, but they were certainly either solid or filled with porous rubber. At the rear there had been a small trailing wheel for stability. An iron fin, painted black and gold, had been added to help the dragon effect. The high mudguards had been extended into short backswept wings. A long metal dragon’s head had been added to the front of the radiator and the headlamps had been given black centres to make ‘eyes’. That was all there was to it, except that the cabin had been covered with an armoured dome and the flame-thrower added. It was, as Bond had thought, a tractor dressed up to frighten and burn–though why it had a flame-thrower instead of a machine gun he couldn’t imagine. It was clearly the only sort of vehicle that could travel the island. Its huge wide wheels would ride over mangrove and swamp and across the shallow lake. It would negotiate the rough coral uplands and, since its threat would be at night, the heat in the iron cabin would remain at least tolerable. I tried to incorporate the huge tires, the mudguards turned into short, backswept bat wings, the long metal dragon’s head added to the front, with the existing headlights turned into the dragon’s eyes, the armored dome on top and the fin. Definitely a crude sketch, but I think it at least gives us an idea. From The Complete Ian Fleming’s James Bond Dr No The Classic Comic Strip Collection. The tires are not quite the same as described by Fleming, but the other details check out. Interestingly the head of the dragon here is elongated, which is something that hadn’t occurred to me but makes sense. The lower picture shows the bat-like wings over the tires, which match up pretty well with my version. In Dr No, James Bond has just been given the news that against his preference, he will be receiving a new weapon, the Walther PPK 7.65 mm. 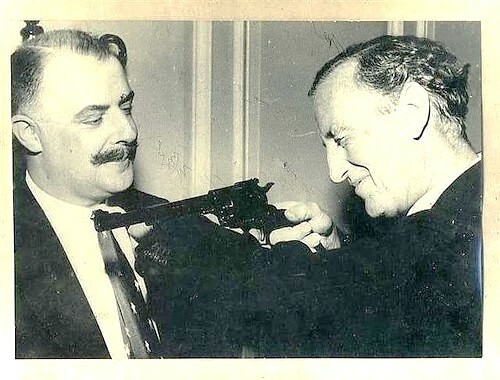 Bond reluctantly accepts the decision of the Armourer as to choice of weapon, and the inquires as to the best way to carry the gun. The recent release of the book The Man With The Golden Typewriter is a boon for Bond researchers as it shows you directly how Fleming got much of his information. In this case a fan named Geoffrey Boothroyd. There is an entire chapter in the book entitled ‘Conversations with the Armourer’, in which the extensive correspondence between Fleming and Boothroyd is chronicled. Now to gun harness, rigs or what have you. First of all, not a shoulder holster for general wear, please. I suggest that the gun is carried in a Berns Martin Triple Draw holster. 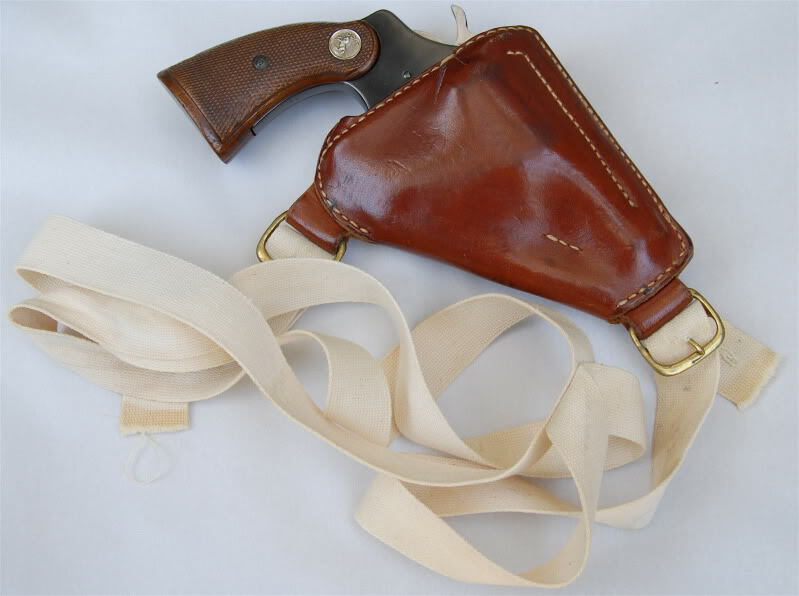 This type of holster holds the gun in by means of a spring and can be worn on the belt or as a shoulder holster. I have played about with various types of holster for quite a time now and this one is the best. Boothroyd sent Fleming a series of prints to show the various ways in which the holster could be worn. ‘A’ Series. Holster worn on belt at right side. Pistol drawn with right hand. ‘B’ Series. Shoulder holster. Gun upside down on left side. Held in by spring. Drawn with right hand. ‘C’ Series. Holster worn as in A, but gun drawn with left hand. ‘D’ Series. Holster word on shoulder, as in ‘B’ series, but gun drawn with left hand. Boothroyd provided Fleming with 2-4 points of note under each of these series. 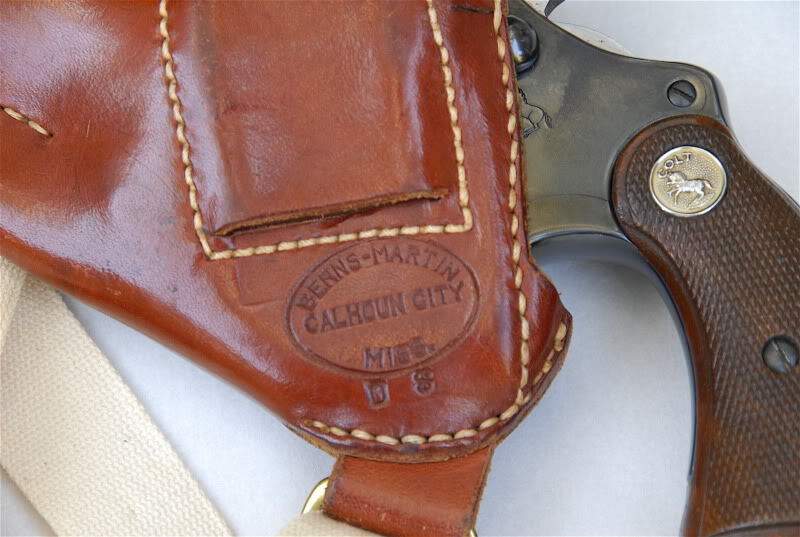 The Berns Martin people live in Calhoun City, Mississippi, and a note to Jack Martin, who is a first class chap and a true gunslinger, will bring you illustrations of his work. Bond’s chamois leather pouch will be ideal for carrying a gun, but God help him if he has to get the gun out when the other fellow is counting the holes in Bond’s tummy. Even after getting the information here, it was still a little inaccurate. When Fleming wrote Dr No, he had Bond issued the Berns Martin Triple Draw holster, but with the Walther PPK. 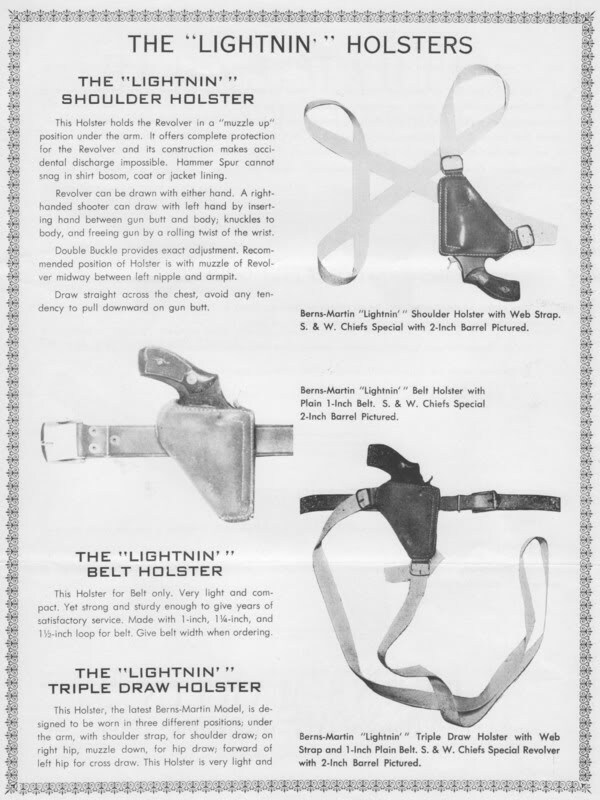 Boothroyd wrote to tell him that the holster could only be used with a revolver (such as the Smith and Wesson) and not his new Walther, which was an automatic. As Moonraker opens, Bond is in the firing range in the basement of the headquarters building, getting some firing work in with the Instructor. THE TWO thirty-eights roared simultaneously. The walls of the underground room took the crash of sound and batted it to and fro between them until there was silence. James Bond watched the smoke being sucked from each end of the room towards the central Ventaxia fan. The memory in his right hand of how he had drawn and fired with one sweep from the left made him confident. He broke the chamber sideways out of the Colt Detective Special and waited, his gun pointing at the floor, while the Instructor walked the twenty yards towards him through the half-light of the gallery. 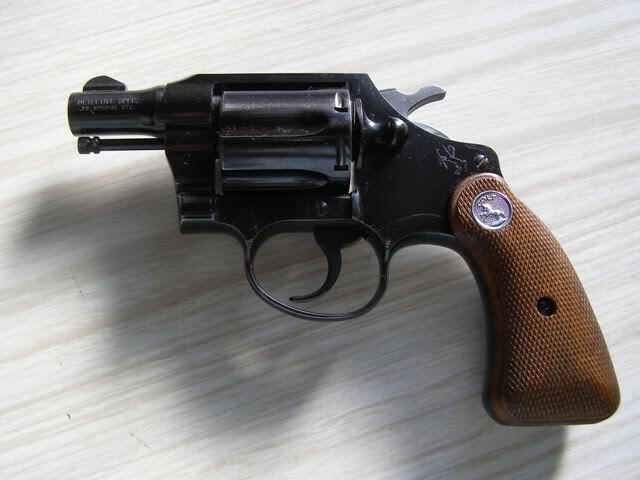 The Colt Detective Special is short-barrelled revolver favored by detectives for both its stopping power (.38 Special) and ease of concealment. Bond was likely using a second series CDS here, which were manufactured between 1947 and 1972. This is a 1956 model, so about a year or two away from the events of Moonraker, but as part of the second series of the CDS, the overall design would’ve been the same as the one James Bond was using. Tee-Hee in Live and Let Die also carried a .38 Colt Detective Special, which Bond took off him after knocking him out. Bond then used the gun to shoot his way out of the garage. There was a new and powerful Champion harpoon gun and a commando dagger of the type devised by Wilkinsons during the war. Finally, in a box covered with danger-labels, there was the heavy limpet mine, a flat cone of explosive on a base, studded with wide copper bosses, so powerfully magnetized that the mine would stick like a clam to any metal hull. There were a dozen pencil-shaped metal and glass fuses set for ten minutes to eight hours and a careful memorandum of instructions that were as simple as the rest of the gear. 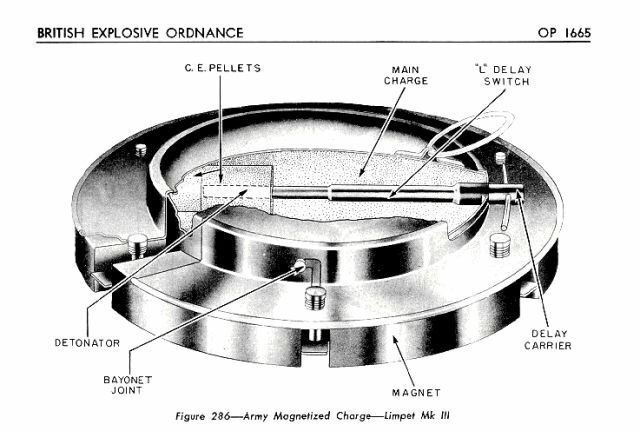 There was even a box of benzedrine tablets to give endurance and heightened perception during the operation and an assortment of underwater torches, including one that threw only a tiny pencil-thin beam. For the Champion harpoon gun, someone can correct me if I’m mistaken, but I’m assuming it was the Arbalete Champion speargun which Bond had received. I can’t say for sure this is what Bond used – I don’t even know what year this gun is, but hopefully this allows you to picture at least the type of speargun he was using. 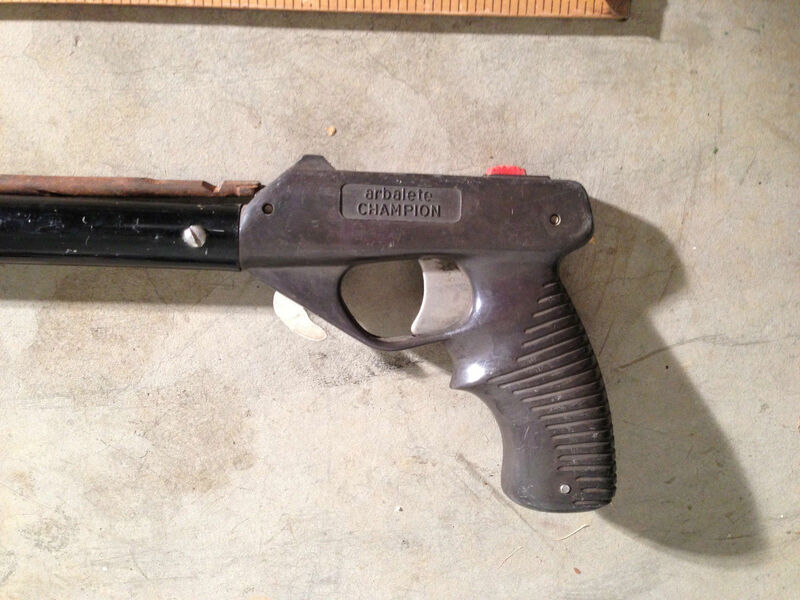 Bond had a Champion harpoon-gun with double rubbers. The harpoon was tipped with a needle-sharp trident – a short-range weapon, but the best for reef work. 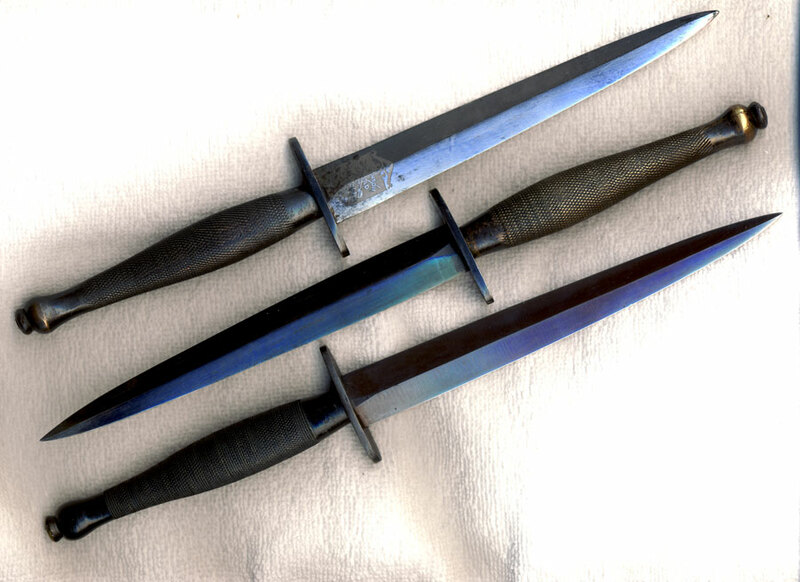 While these three knives may look the same, and indeed were designed to look alike, the top knife above is the Wilkinson, and the other two are look alikes from the same era. For more on the Wilkinson knives, check out this excellent website: The Wilkinson F-S Collection. 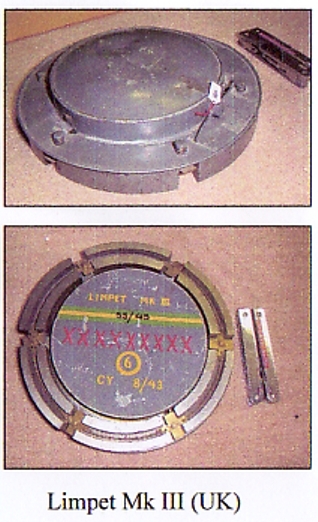 As for the limpet mine, it sounds like it looked like this. Walking up the path to the side entrance. Heading outside, down the stairs in the cliffside. Obviously not the original stairs. To the right of the entrance. Closer look at the front of the house. Back up the other side of the cliff. A look back at the room before heading to Fleming’s room. View from the desk. Fleming had this window closed when writing. The desk and chair where Ian Fleming wrote James Bond. Tree planted by PM Anthony Eden after Suez crisis in 1956. View from the day bed. Carl Miller on Philopon. A Japanese murder-drug.